The International Skating Union’s 57th annual Ordinary Congress took place in early June in Sevilla, Spain. The five-day event brought together more than 350 delegates from member nations all over the globe to consider and vote on more than 400 proposals. Delegates discussed everything from the value of a single toe loop jump to the technical specifications of a speed skater’s uniform. In terms of figure skating, a number of changes were approved, which will shape what the sport will look like for the next two years and, perhaps, through the 2021-2022 season. The most notable change is to the scale of the Grade of Execution (GOE) scores that judges can assign to each technical element. The old scale allowed for seven possibilities — from -3 to +3 — but that has now been increased to 11 options — from -5 to +5. After a technical element is completed, judges will assign a GOE based on a laundry list of criteria. To earn a +5 on a jump, for example, a skater will need to meet criteria for five of the six bullet points for jump elements. Falls will now receive a GOE of -5. The men’s and pairs long programs have been shortened by 30 seconds to align with the ladies and free dance disciplines. Competitive programs for senior-level skaters will be four minutes in length (plus or minus 10 seconds), and three minutes and 30 seconds at the junior level (again, plus or minus 10 seconds). As a result, the men will be limited to seven jumping passes instead of last season’s eight. Pairs teams will no longer perform a solo/combination (side-by-side) spin. Singles skaters will also be limited to repeating two triple or quadruple jumps in the free skate, and in the case of the four-revolution jump, only one may be repeated. Additionally, the base value of the triple Axel and the quadruple jumps has been reduced dramatically as per the chart below. In what might be referred to as the “Zagitova Rule,” the bonus for performing jumps in the second half of a program has been redefined. In the short program, a skater will receive a bonus on the final jumping pass if it is executed in the back end. In the free skate, that will apply to the final three jumping passes, provided they are also executed in the second half of the program. Singles skaters are no longer required to execute steps or any move directly preceding a solo jump in the short program. A half-loop jump will no longer be listed as a single rotation (1Lo) on protocols. Instead, the artistic roller- skating term, ‘Euler,’ will be recorded as 1Eu on protocols. In what can be viewed as a nod to the need for the development of pairs skating across the member nations, the number of teams that will compete the free skate at the World Championships has been increased from 16 to 20, beginning with this season. Medals will now be awarded at all Championships in reverse order of what had previously been the norm. Going forward, the order will be bronze, silver, gold. This change brings the sport into line with how medals are awarded at an Olympic Games. Ice dance will perhaps see some of the most significant changes this season. Gone is the short dance moniker and in comes the rhythm dance. The modification is in name only, however, as skaters will still perform a pattern dance with similar technical elements as in previous seasons. It was determined that the term ‘rhythm dance’ is better aligned with what the competition is all about. Another change in ice dance is how twizzles will be judged. 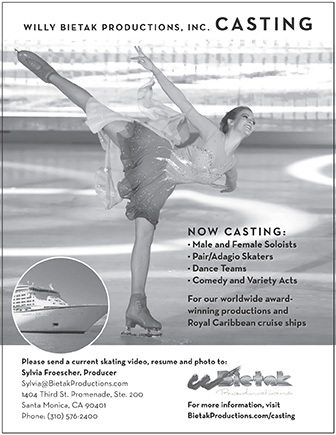 This season, each skater will be judged individually on their execution, earning their own GOE. The two GOEs will be added up,and the team will receive a combined GOE score for that element. “Tea Time Foxtrot,” created by nine-time Polish champion Sylwia Nowak; “Maple Leaf March,” crafted appropriately by the Canadian-based coaching team of Carol Lane and Juris Razgulajevs; and the “Rhumba D’Amour,” by legendary Olympic ice dance champions Jayne Torvill and Christopher Dean. Three new technical elements will be introduced in ice dance this season — a choreographic sliding movement, a choreographic character step sequence and a combination sequence. The sliding movement is a new option for the ‘choreographic element’ criteria in the free dance for both junior and senior level skaters. It is basically a controlled sliding movement across the ice on a part of the body by either partner. The character step sequence serves to infuse the flavor of the dance and does not have restrictions in terms of dance holds or steps. It simply needs to enhance the music. Senior level skaters are required to do this element in the free dance, while juniors can choose to use it to fulfill the choreographic element criteria. The combination sequence is a required element in the free dance for both junior and senior, which require skaters do one-foot turns simultaneously while not touching. The skaters can choose brackets, counters, rockers, or twizzles that do not have to match, but must be done simultaneously. There were two notable changes to the ‘General and Specific Duties and Powers’ to which ISU officials must adhere. Language was added effectively banning mobile phones, tablets, and smart watches from the officials stand. And in order to maintain neutrality and remain unbiased, ISU officials may not serve in the capacity of Team Leader at any point in a season when they are assigned to a panel at a Championships or Olympic Winter Games. Since the International Skating Union (ISU) judging system was introduced in international competitions in 2003, the ISU has been constantly developing and fine-tuning the system. The 2018 ISU Congress adopted some important changes to adapt the system to the development of the sport. In order to have more possibilities to evaluate the quality of elements performed by the skaters, the range of the Grade of Execution (GOE) has been expanded from -3 to +3 to now -5 to +5 in all figure skating disciplines. There are now a total of 10 Grades of Execution. Together with the GOE, a new Scale of Value for the elements has been created, which is based on the percentage principle. Each plus or minus step in the GOE results in increasing or decreasing the value by 10 % in singles and pairs and by 16 % in ice dance. The ISU Technical Committees Chair for singles and pairs as well as for ice dance provide a detailed explanation of how the GOEs are determined in webinars that can be viewed on the ISU YouTube Development Channel here.